From Munich, Germany, Ugh! is a trio consisting of Martin on guitar, Sony on bass and vocals, and Tim on drums, along with various guests on guitar (including Stefan from Colour Haze) and saxophone. Metaustrat is their second album. Ugh! play a raw and raucous brand of Stoner-psychedelia. The album opens with "In Vain", which has battering Stoner psych riffs and a nice groove, though I can't say I care for the vocals too much. The band have a FAT sound with music that is crushingly heavy but with thoughtfully structured playing buried in the thudding jams. "Pagan Ride" is a nearly 9 minute instrumental that demonstrates similar playing and I was impressed by the bands' narrative style that is down n dirty and totally stoned, but continually evolves through a number of steadily developing themes. I definitely had the sense that a story was being told. And dig that spaced out finale. But Ugh! are a little uneven as I had a sense of chaos on songs like "Fatburner", which was a bit lacking in direction, though the sax solo was a nice touch as was the spacey closing bit. Still there are some pretty decent moments on the album. "Hermetic" is a get down boogie-woogie Stoner rock n roll song with an extended instrumental jam that includes fiery guitar soloing with a stripped down sound I enjoyed. "Tandoori Beefeater" is similar but when the guitars are crashing it sounds remarkably like Finnish space-krautrock-trance-post-rockers Circle. Love that screaming slide guitar on "Deep Red River". "Cubicle" is one of the trippiest songs of the set. It pounds hard and heavy with an acid laced edge, while kicking out wailing and grooving psych leads. And "Terminus" rolls through with a valium paced riff laden metallic drive that takes off into a very cool doomy but gorgeously spaced realm. In summary, I liked Ugh! 's raw, thrashy stoned sound, and when they're on a roll Ugh! are both heavy and way out in space. However, at times the band seem to be lacking direction and in these instances the rawness that works elsewhere just sounds undisciplined. And maybe it's just a matter of taste but I was not able to warm up to the vocals. Still, Ugh! are a band with a lot of possibilities. 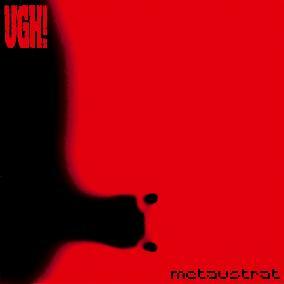 Metaustrat is distributed by Elektrohasch Records. You can visit their web site at: http://www.elektrohasch.de.